Used car dealers have great deals, but you can increase your chances of finding a good value by timing it right. One thing to consider is the current changes manufacturers are offering. Because they are limiting and eliminating leases, good used cars will get harder to find in the future. If you’ve been on the fence about a new automotive addition to the family, now is likely a good time. The deals being offered by manufacturers are also something to consider. If they are offering a number of deals or trying to clear out last year’s models, you aren’t likely to get top dollar for your trade in or a good deal on used models. If you decide to trade in your current ride, try to do it while it is still under warranty; used car dealerships will value them higher because they can use them in their Certified Pre-Owned program. Many times, companies and consumers turn in fairly new vehicles frequently in order to keep a new looking fleet, or because they just don’t like the vehicle. Many of them are models that didn’t sell well at their release. These vehicles will likely have low mileage and a lower price to go with it. This means you can get a next-to-new vehicle for a good deal. It is ok to wander through used car dealerships looking for cheap vehicles, but keep in mind that these aren’t always the most economic choices. For instance, you might find a newer vehicle for a few thousand dollars, but after a month of driving it, you’ll discover it needs a motor, transmission, water pump, and radiator. Not such a good deal, huh? One way you can protect yourself is by purchasing Certified Pre-Owned vehicles. Mechanics have already examined these vehicles carefully to ensure they are in good working order. Also, be sure not to underestimate the importance of a good test drive. If you bring a mechanically inclined person with you, he or she will help you identify anything that doesn’t sound right or any parts that might be wearing. When you need a set of wheels, it can be tough to find one that will fit a smaller budget while still meeting your needs. Used car dealerships are an excellent place to find good deals on a quality used vehicle. By following these few simple tips, you can make it even more affordable. Now you can easily and affordably trade in your old, gas guzzling clunker for a newer, fuel-efficient car. This is the optimal time to unload your old beater and replace it with a nicer looking, better running, and more fuel-efficient used car or truck. The current economic crisis has forced many used car dealers to lower prices on their entire inventory, providing you with yet another reason to go shopping for a new-to-you used car today. Many online shopping opportunities eliminate your need to waste time and fuel driving around to different used car dealerships. Look for websites that provide you with current inventories, special offers, and financing opportunities. You can trade-in your current vehicle for a discounted price on a more fuel-efficient model. Get that gas guzzling car or truck out of your driveway and replace it with a better operating and more fuel-efficient vehicle. As new car buyers take advantage of the Cash For Clunkers program, car dealers have plenty of models for you to choose from. It also makes this a great time to get the most out of your older vehicle. Your first step in getting the best trade-in value for your used car or truck is cleaning it up and collecting your paperwork. Show your used car dealer all maintenance and repair records to offer a better understanding of your vehicle’s past. It should go without saying, but give your older car a bath and vacuum out the layers of kid crumbs, dropped French fries, and gum wrappers. You can also help yourself to get the best trade-in value by educating yourself online about the current Kelly Bluebook value of your vehicle. Before deciding how much you can afford to spend on a used car or truck, you must evaluate your current financial situation. This includes comparing your income with your regular expenses, your savings needs, and the cost of maintaining your current vehicle. In factoring the cost of your current vehicle, you must consider fuel efficiency, maintenance costs, the price of replacement parts, parking and storage fees, repair services, and insurance. You will probably discover that your current vehicle is costing you far more than you realized. Older cars tend to break down more frequently and repairs can be quite costly. Towing charges, lost wages, and replacement transportation costs can add up rapidly. Often when an older car starts to break down, owners find as soon as they pay for one repair, another repair is needed. There comes a time when a vehicle is no longer cost effective to maintain. A newer, more fuel efficient car can save you money in many ways, not just at the fuel pump. If you are considering trading in your older vehicle for something better, these simple steps will provide you with a higher than normal trade-in value, thereby reducing the sale price of your newer vehicle. This lowered sales price translates into lower taxes, a reduced interest expense, and a far more fuel-efficient used car to get you to work, shopping centers, and family gatherings. Buying used cars is the source of many headaches for numerous Americans. In fact, purchasing a second hand vehicle is so synonymous with dread that it has become something of a joke in many circles. Some find dealing with sales people to be the source of their grief while others cite looking through rows upon rows of cars as the trigger for their discomfort. However, it doesn’t have to be this way. Buying a used car doesn’t have to be a bad experience. In fact, if you go about it properly, you can find a great car for little money without having to sell out your sense of wellbeing in the process. 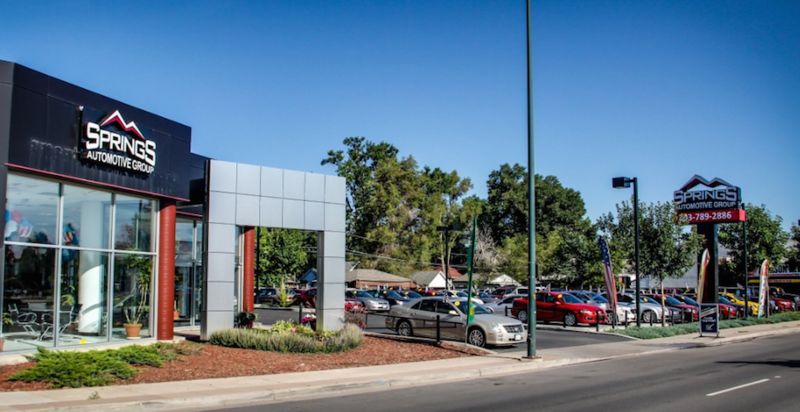 If you are looking for used cars in Colorado Springs, CO, there are many options available to you that will make the experience much easier. This article explains how to tackle this job correctly, which means getting you a great price on a lightly used vehicle. Thanks to the internet, it has become much more common for consumers to purchase their car sight unseen. The internet offers buyers great prices on a wide range of cars. However, one thing the web does not offer you is the chance to drive the car, kick the tires, and negotiate with a real live human being. When buying a used car in Colorado Springs, few things can beat actually testing the car for yourself. When buying locally, you get that chance. You can wheel, deal, and browse around. When buying locally, you also get the satisfaction of knowing you are contributing to your own community. While you may get a slightly better price online, you are not getting the benefit of seeing your dollars in action around the community. When buying a car in your area, you will want to make sure you are getting the best possible price on the car you want. This will of course mean a little creative deal making with the salesperson. You can make deals at almost any car lot in America, but for the best deals, you should search for a dealer who operates with a very low overhead. The lower a dealer’s overhead, the lower their prices on the vehicles they sell. You see overhead dictates how much used cars sell for because without reaching a certain point each month, the lot loses money. And the more money lost, the higher prices must go to make up for it. You want to search for a dealer who has plenty of great cars, but not a whole lot of employees and other hands in the till. In this economy, it is harder and harder to finance a vehicle purchase. Scoping out a dealership that is willing to assist you with securing financing is paramount to purchasing a car unless you have the cash lying around to cover the cost. There are many dealers of used cars in Colorado Springs more than willing to help you secure financing when you buy from them.